Now, as we look at this, keep in mind that this test occurred when Abraham's faith was fully developed and strong enough to bear it. God has determined that his children are to walk by faith and he diligently works with each one of us to develop that faith. If you or I had met Abraham on his way up to Moriah and asked him, What are you doing? He would have said, I'm going to a place where I'm going to sacrifice my son, Isaac. We probably would have replied, You've got to be kidding! No, Abraham would have replied, God told me to do it so I'm just trusting him. I've been walking with him for over 50 years now, and he has never failed me yet. Everything he's asked me to do has always turned out for the best. Doubtless, what God asked Abraham to do that day was the most unique request God has ever made of a human being. It was the supreme test of Abraham's faith. 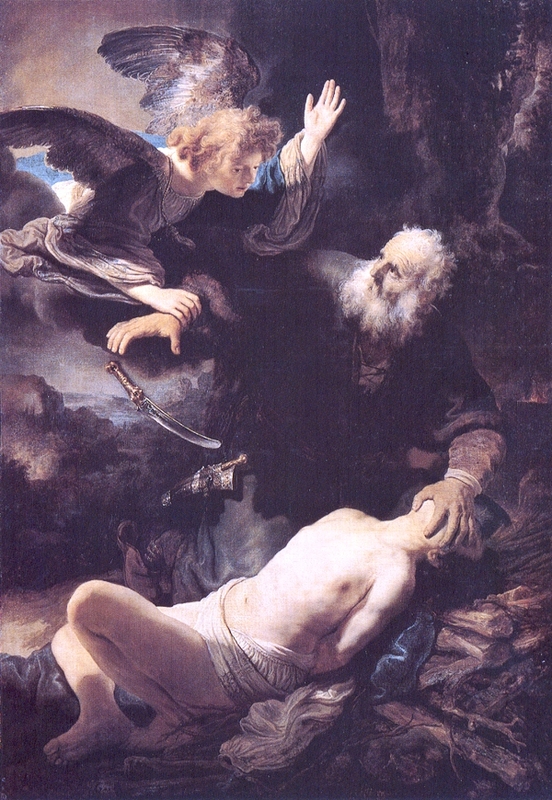 And, as Abraham proceeded to carry it out, he certainly had no clue that what he was doing was painting an elaborate picture of what, in fact, would actually occur in history some 2000 years in the future when, on this very same hill, another Father would, indeed, sacrifice his Son. Then Jesus answered and said to them, 'Most assuredly, I say to you, the Son can do nothing of himself, but what he sees the Father do; for whatever he does, the Son also does in like manner. For the Father loves the Son, and shows him all things that he himself does; and he will show him greater works than these, that you may marvel. 3. ...go to the land of Moriah ... on one of the mountains of which I shall tell you. Yet it pleased the LORD to bruise Him; He has put Him to grief. When You make His soul an offering for sin, He shall see His seed, He shall prolong His days, And the pleasure of the LORD shall prosper in His hand. He shall see the labor of His soul, and be satisfied. By His knowledge My righteous Servant shall justify many, For He shall bear their iniquities. So Abraham rose early in the morning and saddled his donkey, and took two of his young men with him, and Isaac his son; and he split the wood for the burnt offering, and arose and went to the place of which God had told him. Then on the third day Abraham lifted his eyes and saw the place afar off. And Abraham said to his young men, 'Stay here with the donkey; the lad and I will go yonder and worship, and we will come back to you.' So Abraham took the wood of the burnt offering and laid it on Isaac his son; and he took the fire in his hand, and a knife, and the two of them went together. But Isaac spoke to Abraham his father and said, 'My father!' And he said, 'Here I am, my son.' Then he said, 'Look, the fire and the wood, but where is the lamb for a burnt offering?' And Abraham said, 'My son, God will provide for Himself the lamb for a burnt offering.' So the two of them went together. Then they came to the place of which God had told him. And Abraham built an altar there and placed the wood in order; and he bound Isaac his son and laid him on the altar, upon the wood. And Abraham stretched out his hand and took the knife to slay his son. 6. It was on the third day that Abraham and Isaac arrived at the place of sacrifice. God gave Abraham his son back on the third day, just as God himself would one day receive his only Son back on the third day. 7. Abraham left his servants behind and went alone with Isaac to the hill of sacrifice. 8. Abraham took the wood of the burnt offering and laid it on Isaac to carry. 9. Isaac was concerned about the fact that they had not brought a lamb for the sacrifice. 10. When all was ready, Abraham bound Isaac his son and laid him on the altar. There is a good bit that is left unsaid in this statement. How old do you suppose Isaac was when this occurred? Well, Sarah was about 91 (17:17) when Isaac was born and she died after this event at the age of 127 (23:1). This "sacrifice of Isaac" event occurred when Abraham was living in Beersheba where they stayed for many days (21:34). Later, they moved on to Kirjatharba, where Sara died (23:2). And, although I can't say for sure, it would not surprise me if Isaac was the exact same age as our Savior when he was placed on that altar by his father, Abraham. In fact, I strongly suspect that Jesus and Isaac were the exact same age to the very day. Jesus was not held down nor subdued when he was nailed to the cross. He offered himself voluntarily … laying down his life for you and me. And, Isaac fulfilled the type perfectly, by submitting to his father, Abraham, in the same manner. What must have been running through Isaac's mind during all of this as he submitted himself to being tied and laid upon that altar? Well, why don't we ask him one day. His reply will surely be fascinating, aye? Again, the evidence here points to the fact that Isaac, like Jesus, laid down his life willingly under his father's hand. 11. It was a blood sacrifice that was to take place. ...and without shedding of blood there is no remission (of sin). At that exact moment in time, the picture had become as complete as God would allow it to be. Abraham had passed the test. He had given up his home, his kin, Lot, Ishmael, and now his only son, Isaac ... simply because the Lord asked him to. That's amazing faith, my friend. Remember, true faith is always measured by obedience. Do you think Abraham would have gone through with it? I believe he most assuredly would. Then the Angel of the LORD called to Abraham a second time out of heaven, and said: 'By Myself I have sworn, says the LORD, because you have done this thing, and have not withheld your son, your only son; 'blessing I will bless you, and multiplying I will multiply your descendants as the stars of the heaven and as the sand which is on the seashore; and your descendants shall possess the gate of their enemies. In your seed all the nations of the earth shall be blessed, because you have obeyed my voice.' So Abraham returned to his young men, and they rose and went together to Beersheba; and Abraham dwelt at Beersheba. Now it came to pass after these things that it was told Abraham, saying, 'Indeed Milcah also has borne children to your brother Nahor: Huz his firstborn, Buz his brother, Kemuel the father of Aram, Chesed, Hazo, Pildash, Jidlaph, and Bethuel. And Bethuel begot Rebekah. These eight Milcah bore to Nahor, Abraham's brother. His concubine, whose name was Reumah, also bore Tebah, Gaham, Thahash, and Maachah. For when God made a promise to Abraham, because he could swear by no one greater, he swore by Himself, saying, 'Surely blessing I will bless you, and multiplying I will multiply you.' And so, after he had patiently endured, he obtained the promise. For men indeed swear by the greater, and an oath for confirmation is for them an end of all dispute. Thus God, determining to show more abundantly to the heirs of promise the immutability of his counsel, confirmed it by an oath, that by two immutable things, in which it is impossible for God to lie, we might have strong consolation, who have fled for refuge to lay hold of the hope set before us. 2. ...by His oath upon Himself ... for he could swear by no greater. Sarah lived one hundred and twenty-seven years; these were the years of the life of Sarah. So Sarah died in Kirjath Arba (that is, Hebron) in the land of Canaan, and Abraham came to mourn for Sarah and to weep for her. Then Abraham stood up from before his dead, and spoke to the sons of Heth, saying, 'I am a foreigner and a visitor among you. Give me property for a burial place among you, that I may bury my dead out of my sight.' And the sons of Heth answered Abraham, saying to him, 'Hear us, my lord: You are a mighty prince among us; bury your dead in the choicest of our burial places. None of us will withhold from you his burial place, that you may bury your dead.' Then Abraham stood up and bowed himself to the people of the land, the sons of Heth. And he spoke with them, saying, 'If it is your wish that I bury my dead out of my sight, hear me, and meet with Ephron the son of Zohar for me, that he may give me the cave of Machpelah which he has, which is at the end of his field. Let him give it to me at the full price, as property for a burial place among you.' Now Ephron dwelt among the sons of Heth; and Ephron the Hittite answered Abraham in the presence of the sons of Heth, all who entered at the gate of his city, saying, 'No, my lord, hear me: I give you the field and the cave that is in it; I give it to you in the presence of the sons of my people. I give it to you. Bury your dead!' Then Abraham bowed himself down before the people of the land;and he spoke to Ephron in the hearing of the people of the land, saying, 'If you will give it, please hear me. I will give you money for the field; take it from me and I will bury my dead there.' And Ephron answered Abraham, saying to him, 'My lord, listen to me; the land is worth four hundred shekels of silver. What is that between you and me? So bury your dead.' And Abraham listened to Ephron; and Abraham weighed out the silver for Ephron which he had named in the hearing of the sons of Heth, four hundred shekels of silver, currency of the merchants. So the field of Ephron which was in Machpelah, which was before Mamre, the field and the cave which was in it, and all the trees that were in the field, which were within all the surrounding borders,were deeded to Abraham as a possession in the presence of the sons of Heth, before all who went in at the gate of his city. And after this, Abraham buried Sarah his wife in the cave of the field of Machpelah, before Mamre (that is, Hebron) in the land of Canaan. So the field and the cave that is in it were deeded to Abraham by the sons of Heth as property for a burial place. First, in Psalm 116:15, we read ... precious in the sight of the Lord is the death of his saints. Perhaps for this reason alone, the Lord has given such space here to the death and burial of his beloved saint, Sarah. Second, this cave ... Machpelah ... would become a very significant and historic place of burial. At this very minute, it still exists and contains the earthly remains of some of God's greatest saints. Abraham and Sarah are buried there (25:9-10), as well as Isaac and Rebekah and Jacob and Leah (49:31-33). They will all come out of that cave one day and, once again, live and walk upon the earth during the Millennial reign of Christ. In the for what it's worth department … I, for one, am uncomfortable with the practice of cremation, especially when it comes to God's people. It is an ancient heathen custom borne of the false philosophy that when one dies it is all over. Fini! The end. Therefore, the body is of no importance. It rots away never to be heard from again. In my opinion, we believers should reject every aspect of that lie. From the beginning of time, the people of God have treated their dead with great respect and tenderness and have buried them in the ground with the sure and certain hope of the resurrection. Our own Lord's body was so treated. So, as often as possible, I believe that we believers should preserve this long and significant heritage. Now, as far as the Lord's ability to raise a cremated child of God from the dead is concerned, there is no question. And, if cremation has already taken place, what is done is done. It certainly is not a sin. It is just out of character with our Christian theology, as well as the practice of the people of God from time memorial. Enough said. Take it for what it is worth. Now Abraham was old, well advanced in age; and the LORD had blessed Abraham in all things. So Abraham said to the oldest servant of his house, who ruled over all that he had, 'Please, put your hand under my thigh, and I will make you swear by the LORD, the God of heaven and the God of the earth, that you will not take a wife for my son from the daughters of the Canaanites, among whom I dwell; but you shall go to my country and to my family, and take a wife for my son Isaac.' And the servant said to him, 'Perhaps the woman will not be willing to follow me to this land. Must I take your son back to the land from which you came?' But Abraham said to him, 'Beware that you do not take my son back there. The LORD God of heaven, who took me from my father's house and from the land of my family, and who spoke to me and swore to me, saying, "To your descendants I give this land," he will send his angel before you, and you shall take a wife for my son from there. And if the woman is not willing to follow you, then you will be released from this oath; only do not take my son back there.' So the servant put his hand under the thigh of Abraham his master, and swore to him concerning this matter. First and foremost, he wanted Isaac to have a wife that shared his faith. The first thing he said to his servant was, swear by the LORD, the God of heaven and the God of the earth, that you will not take a wife for my son from the daughters of the Canaanites. Intermarriage with the heathen has always been a huge pitfall for God's people. In Deuteronomy 7:2b-4, the people of Israel were warned to be sure and watch out for this stumbling block when they entered the Promised Land. You shall make no covenant with them nor show mercy to them. Nor shall you make marriages with them. You shall not give your daughter to their son, nor take their daughter for your son. For they will turn your sons away from following me, to serve other gods; so the anger of the LORD will be aroused against you and destroy you suddenly. It is a great tragedy, how much havoc believers can bring into their lives and the lives of their churches by disobeying this command. The average minister is faced with one problem after another because of it. So, being acutely aware of the absolute crucial nature of his son's marrying a woman who also knew and followed the true and living God, Abraham sent his servant off to his brother's house in Mesopotamia to acquire a wife for Isaac. Second, it was critical to Abraham that his son stay in the land that God had promised them. Twice here, Abraham told his servant not to take Isaac out of the land. He said, Beware that you do not take my son back there. The LORD God of heaven, who took me from my father's house and from the land of my family, and who spoke to me and swore to me, saying, 'To your descendants I give this land...' That's standing on the promises, brother. Abraham had certainly learned his lesson when he, himself, had left the Promised Land. So, he told his servant, If the girl won't come to Canaan, so be it. Then the servant took ten of his master's camels and departed, for all his master's goods were in his hand. And he arose and went to Mesopotamia, to the city of Nahor. And he made his camels kneel down outside the city by a well of water at evening time, the time when women go out to draw water. Then he said, 'O LORD God of my master Abraham, please give me success this day, and show kindness to my master Abraham. Behold, here I stand by the well of water, and the daughters of the men of the city are coming out to draw water. Now let it be that the young woman to whom I say, "Please let down your pitcher that I may drink," and she says, "Drink, and I will also give your camels a drink"; let her be the one you have appointed for your servant Isaac. And by this I will know that you have shown kindness to my master.' And it happened, before he had finished speaking, that behold, Rebekah, who was born to Bethuel, son of Milcah, the wife of Nahor, Abraham's brother, came out with her pitcher on her shoulder. Now the young woman was very beautiful to behold, a virgin; no man had known her. And she went down to the well, filled her pitcher, and came up. 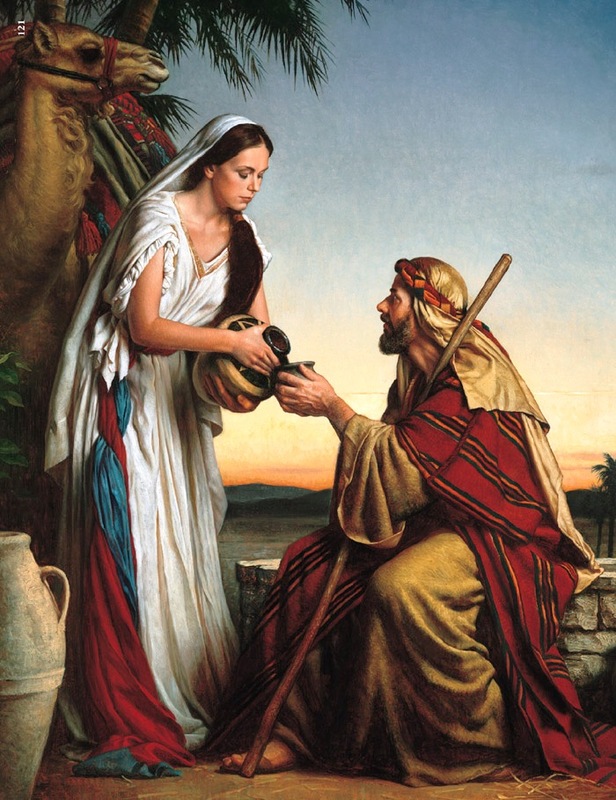 And the servant ran to meet her and said, 'Please let me drink a little water from your pitcher.' So she said, 'Drink, my lord.' Then she quickly let her pitcher down to her hand, and gave him a drink. And when she had finished giving him a drink, she said, 'I will draw water for your camels also, until they have finished drinking.' 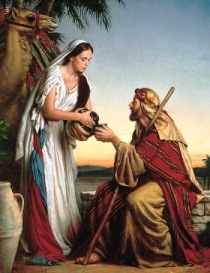 Then she quickly emptied her pitcher into the trough, ran back to the well to draw water, and drew for all his camels. And the man, wondering at her, remained silent so as to know whether the LORD had made his journey prosperous or not. So it was, when the camels had finished drinking, that the man took a golden nose ring weighing half a shekel, and two bracelets for her wrists weighing ten shekels of gold, and said, 'Whose daughter are you? Tell me, please, is there room in your father's house for us to lodge?' So she said to him, 'I am the daughter of Bethuel, Milcah's son, whom she bore to Nahor.' Moreover she said to him, 'We have both straw and feed enough, and room to lodge.' Then the man bowed down his head and worshiped the LORD. And he said, 'Blessed be the LORD God of my master Abraham, who has not forsaken his mercy and his truth toward my master. As for me, being on the way, the LORD led me to the house of my master's brethren.' So the young woman ran and told her mother's household these things. Is this not a beautiful story, or what? The prayer of Abraham's servant, after he arrived in Mesopotamia, is just too precious. Clearly, Abraham had passed on his faith to his household. His servant's prayer really demonstrates that. It was so specific. Great faith prays like that, by the way. It leaves out all the pious phrases and just gets down to business with God. Obviously, Abraham's servant knew just how great his God was. He knew he could ask big things of him. No doubt, the Lord was delighted to hear this servant's prayer. You will notice that the Lord answered him immediately. In fact, while he was still praying, Rebekah, the very girl he was seeking, came walking up to the well. How's that for God's timing! And, not only that, she said the exact things that Abraham's servant had asked God for her to say. Furthermore, she was of Abraham's brother's household! Now Rebekah had a brother whose name was Laban, and Laban ran out to the man by the well. So it came to pass, when he saw the nose ring, and the bracelets on his sister's wrists, and when he heard the words of his sister Rebekah, saying, 'Thus the man spoke to me,' that he went to the man. And there he stood by the camels at the well. And he said, 'Come in, O blessed of the LORD! Why do you stand outside? For I have prepared the house, and a place for the camels.' Then the man came to the house. And he unloaded the camels, and provided straw and feed for the camels, and water to wash his feet and the feet of the men who were with him. Food was set before him to eat, but he said, 'I will not eat until I have told about my errand.' And he said, 'Speak on.' So he said, 'I am Abraham's servant. The LORD has blessed my master greatly, and he has become great; and he has given him flocks and herds, silver and gold, male and female servants, and camels and donkeys. And Sarah my master's wife bore a son to my master when she was old; and to him he has given all that he has. Now my master made me swear, saying, "You shall not take a wife for my son from the daughters of the Canaanites, in whose land I dwell; but you shall go to my father's house and to my family, and take a wife for my son." And I said to my master, 'Perhaps the woman will not follow me.' But he said to me, 'The LORD, before whom I walk, will send his angel with you and prosper your way; and you shall take a wife for my son from my family and from my father's house. You will be clear from this oath when you arrive among my family; for if they will not give her to you, then you will be released from my oath.' And this day I came to the well and said, 'O LORD God of my master Abraham, if you will now prosper the way in which I go, behold, I stand by the well of water; and it shall come to pass that when the virgin comes out to draw water, and I say to her, 'Please give me a little water from your pitcher to drink,' and she says to me, 'Drink, and I will draw for your camels also'; let her be the woman whom the LORD has appointed for my master's son.' But before I had finished speaking in my heart, there was Rebekah, coming out with her pitcher on her shoulder; and she went down to the well and drew water. And I said to her, 'Please let me drink.' And she made haste and let her pitcher down from her shoulder, and said, 'Drink, and I will give your camels a drink also.' So I drank, and she gave the camels a drink also. Then I asked her, and said, 'Whose daughter are you?' And she said, 'The daughter of Bethuel, Nahor's son, whom Milcah bore to him.' So I put the nose ring on her nose and the bracelets on her wrists. And I bowed my head and worshiped the LORD, and blessed the LORD God of my master Abraham, who had led me in the way of truth to take the daughter of my master's brother for his son. Now if you will deal kindly and truly with my master, tell me. And if not, tell me, that I may turn to the right hand or to the left. Then Laban and Bethuel answered and said, 'The thing comes from the LORD; we cannot speak to you either bad or good. Here is Rebekah before you; take her and go, and let her be your master's son's wife, as the LORD has spoken.' And it came to pass, when Abraham's servant heard their words, that he worshiped the LORD, bowing himself to the earth. Then the servant brought out jewelry of silver, jewelry of gold, and clothing, and gave them to Rebekah. He also gave precious things to her brother and to her mother. And he and the men who were with him ate and drank and stayed all night. Then they arose in the morning, and he said, 'Send me away to my master.' But her brother and her mother said, 'Let the young woman stay with us a few days, at least ten; after that she may go.' And he said to them, 'Do not hinder me, since the LORD has prospered my way; send me away so that I may go to my master.' So they said, 'We will call the young woman and ask her personally.' Then they called Rebekah and said to her, 'Will you go with this man?' And she said, 'I will go.' So they sent away Rebekah their sister and her nurse, and Abraham's servant and his men. And they blessed Rebekah and said to her: 'Our sister, may you become the mother of thousands of ten thousands; And may your descendants possess The gates of those who hate them.' Then Rebekah and her maids arose, and they rode on the camels and followed the man. So the servant took Rebekah and departed. Abraham's servant was a "bulldog" when it came to accomplishing the mission upon which he had been sent. We could all learn a lesson from him about that level of dedication and determination, aye? The account here, probably sounds strange to our culture. It took place in a culture where marriages were arranged. Rebekah's father, after hearing the servant's story, knew immediately that the thing was from the Lord and gave his consent. Being a dad of three girls, myself, I strongly suspect he had been worrying about a match for his little girl. Abraham had been right on. He was being led of the Lord, when he sent his servant to the house of Laban. It was the right place to go to find a wife for Isaac. The only snag was that the mother and brother didn't want baby sister to leave for at least ten days. Again, however, the servant prevailed, insisting that he be allowed to complete his mission. So, they asked Rebekah, and she said she was ready to go. Like I said, what an adventure it is to know and follow the true and living God! So it has always been and so it will always be. Now Isaac came from the way of Beer Lahai Roi, for he dwelt in the South. And Isaac went out to meditate in the field in the evening; and he lifted his eyes and looked, and there, the camels were coming. Then Rebekah lifted her eyes, and when she saw Isaac she dismounted from her camel; for she had said to the servant, 'Who is this man walking in the field to meet us?' The servant said, 'It is my master.' So she took a veil and covered herself. And the servant told Isaac all the things that he had done. Then Isaac brought her into his mother Sarah's tent; and he took Rebekah and she became his wife, and he loved her. So Isaac was comforted after his mother's death. You will remember that Beer Lahai Roi was the well that Hagar named. It meant, The Living One Who Sees. This is high drama. Isaac was out walking in the fields. His future wife spotted him first and was then informed he was her future husband. She dropped off her camel and covered herself with a veil. Isaac, hearing the whole story from the servant, then took his bride by the hand and lead her to his mother's tent where their marriage was consummated. Not exactly the way we do it, is it? But, at that time and in that culture, it was the way it was done. And we read, he loved her and he was comforted after his mother's death. Abraham again took a wife, and her name was Keturah. And she bore him Zimran, Jokshan, Medan, Midian, Ishbak, and Shuah. Jokshan begot Sheba and Dedan. And the sons of Dedan were Asshurim, Letushim, and Leummim. And the sons of Midian were Ephah, Epher, Hanoch, Abidah, and Eldaah. All these were the children of Keturah. And Abraham gave all that he had to Isaac. But Abraham gave gifts to the sons of the concubines which Abraham had; and while he was still living he sent them eastward, away from Isaac his son, to the country of the east. This is the sum of the years of Abraham's life which he lived: one hundred and seventy-five years. Then Abraham breathed his last and died in a good old age, an old man and full of years, and was gathered to his people. And his sons Isaac and Ishmael buried him in the cave of Machpelah, which is before Mamre, in the field of Ephron the son of Zohar the Hittite, the field which Abraham purchased from the sons of Heth. There Abraham was buried, and Sarah his wife. And it came to pass, after the death of Abraham, that God blessed his son Isaac. And Isaac dwelt at Beer Lahai Roi. Keturah means incense. As it turns out, Isaac was not the only one to be comforted by a new wife. Abraham also found a wife and began yet another line of progeny. Some have criticized him for his marriage to Keturah. After all, they say, he was old and well stricken in age (24:1)! However, the Lord had said, in multiplying I will multiply thy seed as the stars of heaven (22:17). So, I prefer to see this as just one more example of God's blessing on a man who loved and believed in him. Notice also, that we have Abraham's will here in these verses. He left everything to Isaac, his son of promise, and gave gifts to his other sons while taking the precaution of sending them away to the east lest they make trouble for Isaac after his death. These other sons of Abraham went into Arabia. Many of their names still survive there today. ...just as Abraham "believed God, and it was accounted to him for righteousness. Therefore know that only those who are of faith are sons of Abraham. For if we believe that Jesus died and rose again, even so God will bring with him those who sleep in Jesus. For this we say to you by the word of the Lord, that we who are alive and remain until the coming of the Lord will by no means precede those who are asleep. For the Lord Himself will descend from heaven with a shout, with the voice of an archangel, and with the trumpet of God. And the dead in Christ will rise first. Then we who are alive and remain shall be caught up together with them in the clouds to meet the Lord in the air. And thus we shall always be with the Lord. Therefore comfort one another with these words. Now this is the genealogy of Ishmael, Abraham's son, whom Hagar the Egyptian, Sarah's maidservant, bore to Abraham. And these were the names of the sons of Ishmael, by their names, according to their generations: The firstborn of Ishmael, Nebajoth; then Kedar, Adbeel, Mibsam, Mishma, Dumah, Massa, Hadar, Tema, Jetur, Naphish, and Kedemah. These were the sons of Ishmael and these were their names, by their towns and their settlements, twelve princes according to their nations. These were the years of the life of Ishmael: one hundred and thirty-seven years; and he breathed his last and died, and was gathered to his people. (They dwelt from Havilah as far as Shur, which is east of Egypt as you go toward Assyria.) He died in the presence of all his brethren.